MY weekend has been quite satisfactorily artsy and hands-on, starting with Friday’s delivery of this superb pot by Christopher Bigomba, after months of saving up for it. I met Chris about five years ago under circumstances I can’t remember right now, and got him intricately involved in producing some bespoke pieces of art for me, in his specialty style. He is a master at painting bottles, and I was a master at collecting them. Putting the two characteristics together and lubricating it with money and patience resulted in a very colourful collection of pieces that are dotted all round our home. I’ve always been fascinated by how easily these bottles can be turned from rubbish into art, and spend too much time worrying that there cannot be enough time in the world for Chris to paint ALL the bottles in Uganda. Enter Ronnie Kyazze, a pal I met under other circumstances I won’t go into now either, but that involved Land Rovers. As we were discussing the mechanics of the vehicles one day, I found out he was actually an IT guy. While we were talking about our IT interests, I spotted a neat wooden bird house hanging out of an avocado tree in his garden. It was so much better than the plastic doll house I had taken from my daughter and tied to a disposable plastic party plate, that I had to ask him for its source. He had made it himself. Then he told me he even decorates and cuts used bottles – and shot into the house to get me one. The word ‘non-plussed’ popped up in my mind, and that day I left with the gift of a glass he had cut from an old wine bottle. Many months later he came over to take us through some bottle painting and cutting lessons. I had neglected to soak my accumulation of bottles in water the night before, which is essential for getting the labels and their adhesive to peel off neatly. So I rallied the children round to help soak the bottles, before we washed them and peeled the labels off. After soaking them for a while the bottle labels and adhesive gave way to my pen knife scraping quite easily, and Ronnie threw in some liquid soap to quicken the process so that within a couple of hours we had an array of clean bottles in front of us ready to receive our bottled up creativity. That reminds me – back when I was a child I once scored 22% in a fine art assignment and my teacher was appalled. Her comments made it clear that I would never amount to much as far as fine art was concerned. I intend for none of the children I interact with to EVER grow up with such an idea in their minds. We put together spray paint cans (only five colours), string, raffia, sisal, glue (different types), jute, some sea shells, masking tape and paper (recycled). While cleaning the bottles I got to dismantle the pouring stoppers and extracted some glass marbles as well, specifically from Johnny Walker bottles – which I later sprayed golden and added to the decorative mix as beads. For the designs we used the masking tape round the bottles, and stencils cut out of the disused paper, and the raffia and sisal. The results were not as great as Christopher Bigomba’s, or even Ronnie’s own, but we were proud of our work. After that we got to cutting bottles and creating self-watering planters as well as glasses. The process is so simple that, again, it’s a wonder that so many bottles still go into dustbins in this country. Ronnie whipped out a bottle-cutter – which basically holds the bottle in place and enables you to make an etching where you want to cut it. After that, we poured hot and cold water along the etching simultaneously until the bottle came apart quite smoothly, before we sanded the edges down. At the end of the day, we had a good array of decorative bottles and self-watering planters being looked over by my small group of highly energised young ones with proven creative juices in full flow. Plus, if all else fails, we can make a living out of this – selling these recycled items Made In Uganda. THERE is no ignoring the fact that the Electoral Commission messed up in Kampala and Wakiso Districts on voting day, and this here is not in their defence. Even as the delays were fueling the anger and frustration of voters skeptical and vocal, I put my head into the jaws of an angry social media platform and suggested possible explanations for the delays. I have worked in logistics before, and know first hand how a small error can snowball into a massive disaster – just the same way a short tweet can spiral into a lengthy tirade of an argument. My guessed suggestion, such as it was, came close to the Electoral Commission’s explanation – which was valid, even though some thought it was ‘just an excuse’. Neither was welcome under the heat of the sun and animated tempers – and I realised after a few salvos that my perspective was different from most for good reason. See, my wife and I were the second and third in our first queue, while it was still dark. Actually, we organised the queue, when we noticed that people were bunching up behind and around us. Eventually the officials stopped aligning benches and chairs and joined in the creation of order – identifying each polling station by Register. At seven on the dot there was grumbling as the materials had not yet arrived, and I was pleasantly surprised that as a society we appeared to be developing a consciousness of time. It always irks me to be sitting in a meeting room minutes to the start of a meeting and finding nobody else agitated that it wasn’t going to start on time. When the materials arrived, three minutes after the hour, they were piled atop a pick-up truck underneath a group of determined police personnel and other officials. We went through the transparency process, opening boxes and checking everything was in order in full view of our public. By that time we were fourth and fifth in the queue, and the first two people went through having ticked their names on the FDC register rather than the EC one. The overall EC supervisor, a young lady I’ve known from childhood, quickly caught the anomaly and brought them back to the front after they had voted. Even as I type this my thumb is thick with that indelible ink, because when I got to the end of the queue there was no-one focused on making us take the mark so I made a loud show of doing so, and some amongst the masses queued up applauded. Otherwise I would have made it past with clean fingers. By half past eight in the morning I had driven through eight different polling stations and was in the office following field proceedings. 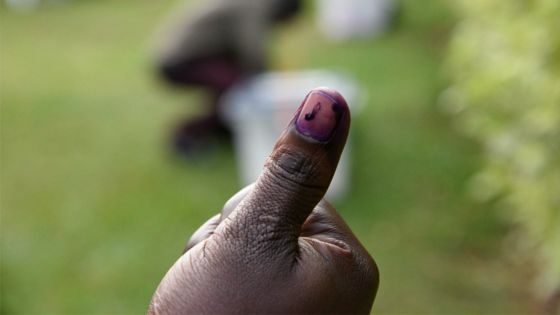 An apologist for the Electoral Commission could argue their case in a number of ways: mathematically, out of the 112 districts of Uganda, two had serious problems – a failure rate of 2.24% – the same could be worked out using the number of polling stations (out of the 28,010) unserved by four o’clock. One could even plead their case after they ‘extended’ voting till late enough for everyone to cast their ballot – but I won’t do that here. Instead, there is a silver lining in how angrily people took the delays, all other factors aside, because we can hope that this marked the beginning of a national tidal wave of seriousness at work, if not at everything we do. As one would tell an apologist doing the mathematics aforementioned – even 98% is not good enough! Aim for 100%, because the impact of that two percent can be VERY damaging when seen from a different perspective or if it gathers momentum and picks up other stuff along the way. It’s how a pimple develops from something minuscule but could turn into a pus-filled orb hanging off your face – made up of much more than what started the pimple, as Uganda is seeing now. If you treat a pimple properly, carefully and early enough in its development, there will be no need to go into surgery or wrap your face up in bandages or to hide away from the public in shame. But if you approach it in a random, careless manner then you could end up with a bad wound or much, much worse in the place everybody notices first about you. Hopefully we will spend every day of the next five years in this country studying our faces carefully in the mirror every morning for pimples developing, scrutinising affairs more strictly so that we totally eliminate mediocrity and inefficiency – however small those mediocrities and inefficiencies may appear to be – so we address them properly before they turn into large, gaping, life-threatening infections. LAST Wednesday I had two girls giggling at me over the incredulous looks on my face as they recounted tales of make up that I could not understand. I was meeting both of them physically for the first time ever and their facial appearance had not been an issue in my mind for the first forty five minutes we were together in conversation before the topic of make-up came up. When it did and they entered into that zone females do that is the stereotypical equivalent of some men talking about soccer or motor vehicles, I kept trying to draw them back until one mentioned that they had first met when one paid the other Ushs20,000 for some lipstick. They were at a Blankets and Wine event and the first girl was walking past the second girl when the first girl was struck by the lipstick the second girl was wearing. She stopped to ask about it and voila! Money exchanged hands and a friendship began. The fourth person in the conversation was a fellow man, called Primus Agaba, who made me feel inadequate because of his vast knowledge of women and make up. He readily followed their conversation and even joined in even though they kept meandering into terminology that I recognised as english but could make little sense of otherwise. He made me re-assess my position as a former boyfriend, ongoing husband, father, uncle and brother of various girls. After hearing him talk for twenty minutes, the only females in my life I wasn’t worried I had offended over the years with my blatant obliviousness were my darling mother and grandmothers before her – because they had zero involvement with cosmetics and make up. I suspect that I am still married probably because my wife is almost the same. The conversation went on for a while longer before it occurred to me that the Ushs20,000 mentioned earlier might not have been paid in exchange for a tube of lipstick, so I paused matters for clarification. The first girl had paid the cash for the tube of lipstick to be unscrewed by the second girl, then applied onto her lips, after which the other screwed the cap back onto her lipstick, pocketed the money, and put both into her handbag (presumably). I was flummoxed. I could understand the concept well enough, of course, but up till that point it had not occurred to me that such payments could be made in exchange for the mere application of make up. First of all, the idea that a person could be walking through an event where food and drinks are being sold and would enter into an impulse expenditure of Ushs20,000 was a little jarring. That’s a double whisky in moderate places, and I don’t find it easy to fork it out fwaaaa. It is also the equivalent of four face-paintings at a children’s event, which expenditure I absolutely dread whenever I am walking into these things. Digging deeper into the matter brought starker realisations – one of them told me that at one point in her life she spent about Ushs150,000 for a tube of imported lipstick. She has since found much more affordable (I like using that word instead of ‘cheap’) options, but of course they are all imported and some of them have names that make the eyes of the more knowledgeable female dilate when they are spoken. And they told me that sometimes a lady you might know will spend Ushs140,000 for make up on an ordinary work day because of a job interview. But that’s nothing if you compare it with the cost of make up for a wedding! Apparently a bride and her entourage will pay these incredible sums for make-up to be applied sometimes during rehearsals, just to see what their different options will look like on the big day, and then again on the big day itself. That morning, make up is applied by professionals and a premium may be charged if that application is done earlier than a certain hour. Not only that; if the make up person is required to do any additional work later on in the day, then more money will be forked out – but the more frugal bridal party might pay a sum up front for a make up pack they can carry with them the rest of the day. All of this costs hard cash that ordinary mortals such as myself have been unaware of all this time – it’s a whole separate economy. And I realised that over the years that is one of those items on wedding budgets that I have never paid much attention to – so I called up a couple of those emailed to me and realised that in most cases it was hidden or thrown in under ‘Salon’. The Make Up expert broke down the numbers for me to my total astonishment, and the ladies laughed even more at my incredulity – while Primus smirked that smirk of a man proven superior over his neighbour. I didn’t care for my status at that point – I had to check what components went into make up in general, and my first stop was lipstick: it’s basically waxes (beeswax, paraffin, and carnauba wax) oils and fats, emollients (the stuff that makes it soft), and pigments. All this can be found in Uganda – even the Carnauba wax. We CAN make lipstick. We SHOULD make lipstick. Because if girls are ready to pay each other Ushs20,000 for a few swipes of the thing to be applied onto their lips, then there is no shortage of demand. If you do more complicated mathematics and presume that there are 1,000 weddings taking place in this country every Saturday, and that each bride (ignore the rest of the entourage for now) will spend at LEAST Ushs100,000 on base make up, then that is Ushs100,000,000 a weekend being spent on make up. Is that not enough reason to get scientists and entrepreneurs together to mix waxes, oils and fats, emollients and pigments?